File 2-0128 - Proposed stores, View and Cook Streets, Victoria, B.C., for Frank LeRoy Esq. 1 architectural drawing : blueprint ; 75 x 54 cm. 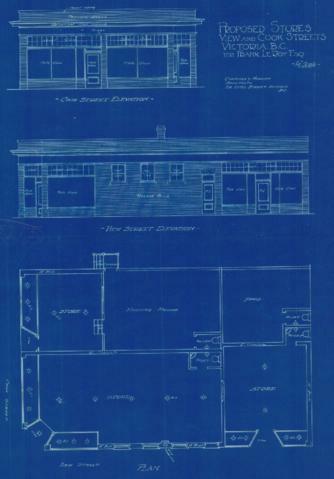 Consists of architectural plan for building at 1122-1124 Cook Street. Two stores face Cook Street, one fronts on View Street (no. 1053).